At times a man just can't help himself, and this is no prelude to an admission of extra marital affairs, illicit interactions with students, or inappropriate pictures on the internet. No, this was just having my head turned by what must be called a painted lady, in this case an azalea whose name is a bit tartish in a Victorian sort of way, "Hilda Niblet". How could this plant not have a female name? 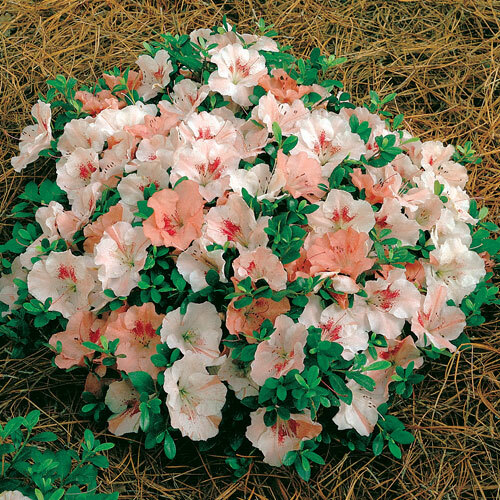 Unfortunately she's a bit too delicate for our climate and struggles mightily in one location and languishes in another, which is too bad because a low-growing azalea is ideal in both locations. For a smallish shrub, Hilda has big pinky-blushy flowers, but she only managed a single bloom this year, and that came 5 weeks later than last year. Given the snow cover this past winter and its general mild nature, Hilda's reaction is a bit puzzling, but she'll get another chance next year.